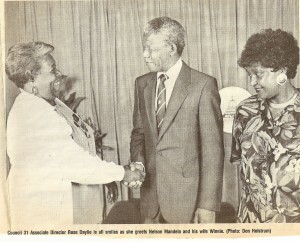 Rose Daylie has had many life-time moments that sparked the interest of various media streams. The sub-pages of “In The News“, is organized by various topics and public recognition’s that Rose has been noted for. Some of the moments are accompanied by precious and esteemed photo’s capturing the events while others will be remembered by the words on the pages. Enjoy the life changing moments that have helped so many, and helped to shape our nations and bring about important monumental changes. Some of these changes have allowed many of us to wear the hats we were, and sit in the seats we occupy. We thank Rose for her service to this nation and for being such a pioneer and strong hero in difficult and challenging times. To view the articles and photos of the sub-pages mouse over the menu “In The News” above can click the pages.